Painter Liam Dangerfield started his residency with XCHC shortly after moving to Christchurch in 2016. After two exhibitions spanning a year of work at XCHC, he moved into his own studio. He is currently working from Chambers Art Gallery, and his new exhibition there, 'Curiously Prosaic,' opens to the public on April 18th. XCHC: Have you always made art? Tell me about an early art memory that stuck with you. Liam Dangerfield: Yes, I’m one of those that’s tried to create from a young age. My parents saw that and encouraged me by buying lots of sketch pads and taking me to galleries. I remember going on regular trips to London, to Tate Modern and the Royal Academy of Arts, and absorbing everything that I saw. I loved that mode of communication, and the emotion that art can convey. I find that other things can’t really do it. During high school I was studying an American artist called Jim Dine. My art tutor at the time put me on to him and I just had to devour everything that I saw of his. We went to London as a group and arranged to go to one of the small dealer galleries. It was in some art district full of expensive looking buildings, and I got to see his work, his actual original work. I remember feeling super lucky and important to be looking at his stuff. 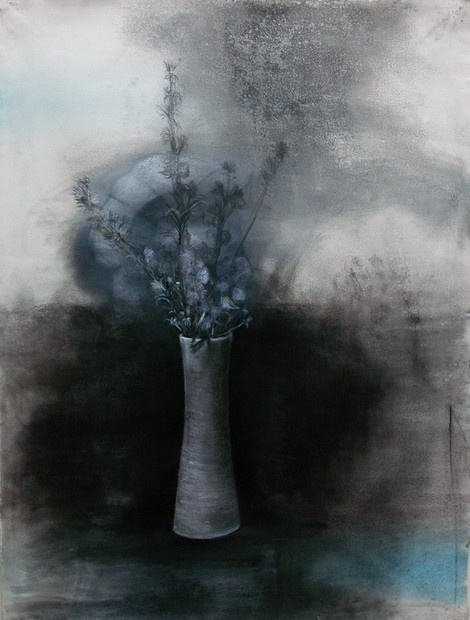 It was work from his ‘flowers and plants’ series, charcoal and acrylic paint, very expressive and almost abstract pieces. I sort of lack the vocabulary to explain what it was about it that appealed to me, but there was something about it at the time that’s carried over to my adult life. It just really worked for me on a visual level, it really did it for me. XCHC: How did you hear about XCHC, and what was your first impression? LD: I come from a background of graphic design, photography, and a bunch of other commercial creative things. I was doing a bit of contracting work for my old employer when I first moved to Christchurch and I wanted an office that wasn’t in the house that I was living in. I wanted a place where I could practice creating art. Since I was contracting, I had the time, and I wanted to put that time into this. I think it was Gordon Harris that had an XCHC flyer. I got in touch with Camia [XCHC founder], came down, and fell in love with the place. I moved in shortly after. I was intimidated initially, but I was really on board with what the XCHC is about. I always associate cities, and especially the arts scene within them, to be… not necessarily impenetrable, but just a bit intimidating. Am I worthy to be here? Is this going to be a real contemporary sort of joint where they’re really picky about who they choose? Turns out, they said yeah. And the space itself just worked, it looked like somewhere where you could come in and make a mess. And I did. XCHC: Did your artwork change while you were at XCHC? LD: Totally, I think just through the act of doing it more. When I first picked up a brush and started buying canvases, I was a bit of a have-a-go enthusiast. In my time at the XCHC I started picking through my sources of inspiration. Having more time to create, I started naturally evolving. Evolving sounds like forward progression, some people might see it as steps sideways or backwards, but I felt like it was changing in a good way for me. It felt like everything I produced was an improvement on the last. That was quite exciting, and it was one of those things where you do something and it works, so you want to do more of it. You inevitably have some failures, but you work around them. That period of time, from moving into my first exhibition at XCHC, and then to the second, I felt like I’d traveled that extreme part of the learning curve. It was really fascinating to see and to experience. XCHC: What was your first exhibition like? LD: It was one of the most life affirming experiences that I’ve ever had. Yeah, those are the actual words that I used with Camia when I told her. It was one of the most incredible times, because I came to it as a newbie, and I went in not really expecting to sell anything. Then I sold work, and I got a really good response from people. It was quite a validating experience for me. It set me on the path that I’m on now. If I hadn’t had that, I probably wouldn’t be pursuing it as strongly as I am. XCHC: What of you is in your work? LD: I’m not entirely sure, but I’m figuring these things out as I go along. People have told me that my work is a bit dark and moody, and yeah, that’s pretty much me actually. [Laughs] I’m a cliche! There’s an amount of uncertainty that comes through in my work, I don’t fully resolve shapes or forms, which maybe is a reflection that I’m fairly indecisive. I used to say that the messiness of it was a joke, but I think it’s actually to do with a desire to get away from an image that’s too perfect and clear cut. That style can be beautiful as well, but for me, having done so much computer work in the past, it’s been nice to have expressive marks, and mess, and accidents on the canvas or the panel. It all adds to it. You do something and then think, I didn’t mean to do that, but then you keep it because it sort of works. You can paint over it, or wipe it away, but the act of wiping it away reveals something else. XCHC: Can you tell me about the collaboration with Lisa Tui [songwriter and XCHC resident]? LD: Lisa is an incredible singer and an amazing person. She’s one of those people who, when I talk to her about something that I’m struggling to figure out in my head, as I’m talking to her, I’ll figure it out. She always puts things into perspective for me. She wanted to write something about one of the paintings that I’d done. The painting was based where Tuam St bisects Manchester, it captured part of C1 Espresso and some containers. She told me that when she looked at it, she felt like there was a story behind the people in the streets and looking out the windows of the cars. She placed herself within that scene i’d created, and felt inspired to write something about it. In that first exhibition my work was very much about that transitional state of Christchurch. Lots of building sites and containers stacked up high propping up buildings. It’s not something you see in every city, it’s quite unique. Lisa was personally affected by the quakes, and I think she felt compelled to write something that complemented the painting. So from that, she worked a story into the song. I can’t articulate what she meant for it to be, but whatever it was, she made it work really well. It felt beautiful to have a sound accompanying that piece of artwork, it was like a soundtrack to a film. To have her there with her talent, riffing off what I’d done… it was one of those experiences where you feel you’re not worthy. It was beautiful to have someone like her say that she’s inspired by what I was doing. On the night, she put on this amazing show, she got everyone singing and really brought another dimension to the exhibition. Rather than it being a contemplative environment, which it still was, it had more life and energy to it. Which was something that I was always trying to convey through my work, a potential energy through the cityscapes, an energy that I associate with these places where there were people and infrastructure. She brought that physically to the exhibition, and to see that synergy, it was awesome. Lisa Tui performs an original piece at Liam's exhibition. XCHC: What was it like to move to your own studio? LD: [This year] I found a studio in the back of Chambers Art Gallery on Moorhouse, and that’s where I am now. It’s been an interesting change. It’s great being in that fine arts environment and around a lot of different types of work. It challenges me and what I think of art. One thing that’s been difficult for me since leaving the XCHC, is the atmosphere of this place. I’d been here for a year, and with the friendships that I’d made, it felt like a home. I miss that open atmosphere and having other people coming by your space for a chat or a look. When you have a door to close you’re a bit more isolated. There are benefits that come with it, but you lose out on that social aspect. Not having that validation you get when someone comes by and is interested in what you’re doing. If you go days without someone seeing what you’re doing, you’re sort of wondering if you’re doing the right thing. Chambers is a dealer gallery, so there are people there. Even though I’ve got my own space, people still pop their head in, but I do miss the vibrancy of XCHC. XCHC: Can you tell me about your upcoming exhibition at Chambers? LD: It’s called ‘Curiously Prosaic’ and it opens on the 18th of April. It’s a joint exhibition with an artist called Kara Burrowes, who is supremely talented. Both of our works focus on the urban landscape, and finding beauty in things that would normally seem mundane or uninteresting. Kara’s artwork is very textural, she uses sculptural pieces and reclaimed wood, and arranges them in patterns. They are wholly abstract, but mesmerising to look at. My work has taken more of an abstract slant as well, it’s still cityscapes, but it’s not literal interpretations of places around the city. XCHC: What is the role of the artist in society? LD: That’s a tough question, it’s something that I think about quite a bit but I’ve never come to a consensus on it. Ultimately an artist is trying to communicate something. A lot of art is contextual, it is based on a time and a place. I think it’s important to have a political voice about what’s going on, challenging what we take as the status quo. But I also think that art is there to inspire people and make them stop and look, have a feeling, or some basic level of emotional response to what they see. So I think there’s the contemporary subversive and ironic art that comments on certain aspects of the world, and then I think that there’s the art that seeks to depict things in a beautiful way in order to make people’s day-to-day seem more enjoyable. I probably fall into the latter camp. I have opinions, but I don’t really feel like I want to voice them, I don’t believe they’re always right. I try to create pieces that are beautiful and inspirational, and if people come to them with their own baggage or thoughts and get something else out of them other than what I’ve intended, then that’s great. XCHC: What does it mean to push the boundaries in your practice? LD: Pushing boundaries is quite hard, and it’s scary, because boundaries are the things that you live within. To go up to them and push back, and find out what’s further, is terrifying because you don’t know if you’re equipped to deal with what you might find, or what frame of mind or thought process you might find yourself in. I wouldn’t say I’m pushing any greater over-arching boundaries, anything avant garde. But pushing my own boundaries and comfort zone has been terrifying and rewarding. It’s meant giving up a full time job and a so-called realistic career. Like anything in life, when you get out of your comfort zone it’s good for you, but it can be a difficult process. XCHC: Is there anything else you want to talk about? LD: Going back to XCHC, it was such a positive experience for me, and I didn’t realise what I had here until I came back. A few weeks ago [quilt-maker and former XCHC resident] Deb had her exhibition and I remember seeing a lot of the people who were here at the time that I was. Being around the space made me realise how much like a family it felt, and how fun it was to come here. This is a place that allows people to give things a go without putting too much stress or pressure on them. If you want to try something, go for it, and you’ve got an awesome and supportive environment to do it. This place is so important to Christchurch, and it’s a place that I’m very glad to have been a part of. Older PostInvitation: "Spreading the Soup Love"